""The Lacemaker" is another small scale painting, nearly dwarfed by its impressive wooden frame. Unlike the more contemplative figures in Vermeer's work, the subject here is very active, intensely focused on a physical activity. As opposed to the full-figure compositions, where furniture and drapery act to facilitate or deflect the viewer's visual entry, "The Lacemaker" brings the subject dramatically to the foreground. As a result, the viewer is drawn into a powerful emotional engagement with the work. Although the composition is quite shallow, there are different depths of field that draw the viewer into the canvas. The forms nearest the eye are unfocused, which encourages the viewer to pass on to the more distinctly defined middleground. "The intimacy is accentuated by the small scale, personal subject matter, and natural composition. The lacemaker's total preoccupation with her work is indicated through her confined pose. The use of yellow, a dynamic, psychologically strong hue, reinforces the perception of intense effort. Contrasts of form serve to animate the image. For example, her hairstyle expresses her essential nature - both tightly constrained and, in the loose ringlet behind her left shoulder, rhythmically flowing. Another strong contrast exists between the tightly drawn threads she holds and the smoothly flowing red and white threads in the foreground. The precision and clearness of vision demanded by her work is expressed in the light accents that illuminate her forehead and fingers. "The diffused ocular effect of the foreground objects, especially the threads, was definitely derived from a camera obscura image. Vermeer used the informal, close framing of the composition suggested by the camera obscura to accentuate the realistic, immediate impact of the painting. Contemporary Dutch painting portrayed industriousness as an allegory of domestic virtue, While the inclusion of the prayer book pays fealty to this theme, it is a secondary concern to the depiction of the handicraft of lacemaking, and, in the highest sense, the creative act itself. 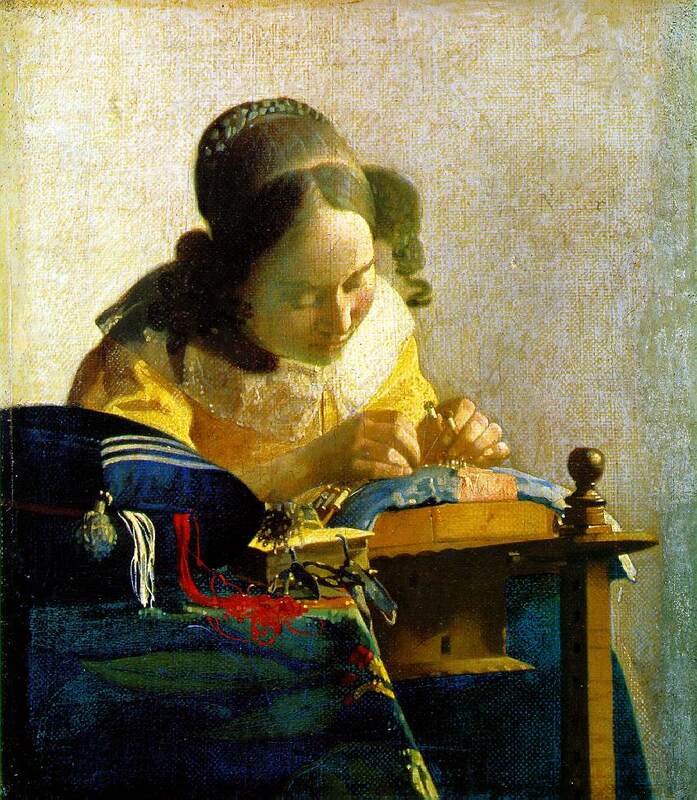 Once again, Vermeer succeeded in transforming a transitory image into one of eternal truth."